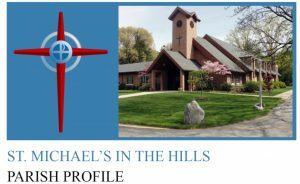 An award of the St. Michael’s Medal is the highest honor that St. Michael’s in the Hills can bestow. The St Michael’s Medal may be awarded to communicants* who have provided years of dedicated and distinguished service to St. Michael’s. c. Treasure: Generous financial gifts. year in which the St. Michael’s Medal is awarded. 3. Medal candidates cannot have previously received a St. Michael’s Medal. 1. The Junior Warden, with the advice and consent of the Rector(s), will appoint the Medal Committee and chair it. 2. The Medal Committee will consist of five Vestry members, each serving for a one year term. 1. Any Saint Michael’s parishioner can nominate a potential recipient. 2. All potential recipients must be present communicants in good standing of St. Michael’s. 3. Nominations describing the nominee’s contributions and service to St. Michael’s must be submitted in writing to the Junior Warden. 4. In order for the St. Michael’s Medal to be awarded at any Annual Meeting, the Junior Warden shall solicit nominations from the congregation. Such solicitation and submissions must be made in sufficient time for the Junior Warden to present the nominee(s) to the Medal Committee, and in sufficient time for the Medal Committee to present the candidate(s) to the Vestry at its immediately following November or December meeting. 5. The Medal Committee will review all nominations. 6. Discussions and deliberations of the Medal Committee shall be kept confidential. 7. Rector(s) and Vestry members may attend Medal Committee discussions, but cannot vote. 8. In order for the Medal Committee to recommend a candidate to Vestry, a minimum of four Medal Committee members must vote for that nominee.